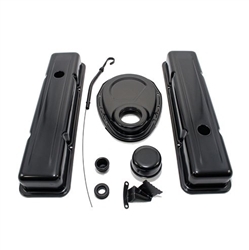 Chevy small block short EDP Black steel valve covers fit 1958-86 Chevy 283-305-327-350 small block engines. They are baffled and short (OEM) style. There is one hole in each cover. Height: 2-5/8 ". Black Tie-EDP, is an electronically applied process in which metal parts are given an electric charge and immersed in an opposite charged paint solution. The electric current then attracts and adheres the paint solution to the part to provide unparalleled coverage to the entire part including corners, edges and recessed areas. This provides an excellent rust resistant coating with an even and continuous film without pinholes over the entire surface. 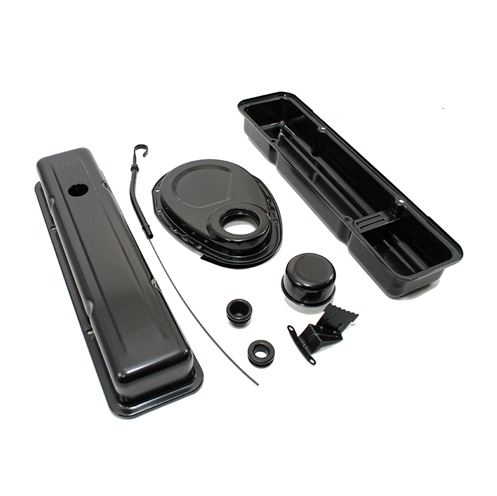 The superior quality of EDP can be used as is with its OEM style satin black finish or is the perfect base for powder coating or custom painting. EDP is also environmentally friendly as the electro coat produces little or no HAPS (Hazardous Air Pollutants) or VOCS (Volatile Organic Compounds) and is OSHA, ROHS and EPA compliant. 1) 1 pair of smooth baffled OE short style Black steel valve covers. 2) 1 engine dipstick with Black steel tube.